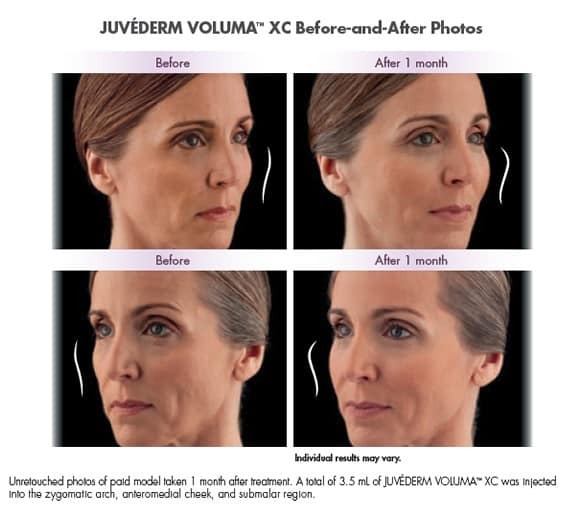 Juvederm Voluma is an FDA approved hyaluronic acid used as an injectable filler to restore volume to the mid-face. Over time, our face changes and lose its structure due to the normal aging process, genetics and environmental factors. Lines and wrinkles appears, cheeks flatten, and skin start to sag. The loss of volume is noticable in the cheeks causing the skin to sag and creating parentheses lines (lines that appear when you face is at rest). Parentheses lines can be filled using gel based fillers such as Juvéderm® XC which last up to 6 months however, it is recommended to treat the problem at its roots and rebuild the volume in the cheeks to lift the cheeks, thus reducing the lines and plumping the face to it’s younger look. Hyaluronic acid is a substance that naturally exists between the cells in your body giving your skin a firm and youthful appearance. As you age, hyaluronic acid decreases in the body depleting your skin from moisture and volume and combined with other factors increase the appearance of wrinkles and fine lines. How does Juvéderm Voluma® Works? 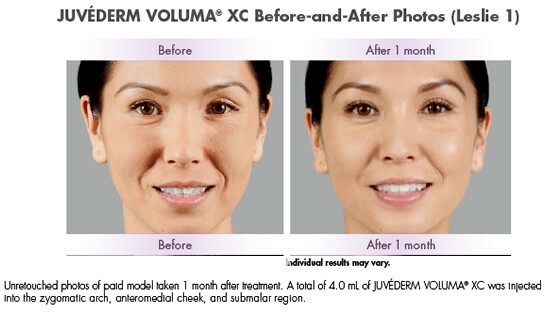 Juvéderm Voluma® is injected into the cheek to restore volume, natural suppleness and contour the face. There is no downtime and results are immediate. The injection of Juvéderm Voluma® is minimally painful. We use Juvéderm Voluma® XC which contains lidocaine and can apply a topical treatment to improve comfort during treatment. The treatment takes about 15-20 minutes only. Juvéderm Voluma® is used specifically in the cheek area to make them appear more plump and youthful, unlike other injectables which “fill creases” or relax faciel muscles. Botox® Cosmetic, Xeomin®, Dysport® are injectables that reduce the appearance of wrinkles by gradually relaxing facial muscles. Juvederm®, Restylane® and other fillers are similar injectables that focus more on deep lines around the nose and mouth and are used to target laugh lines and thin lips. 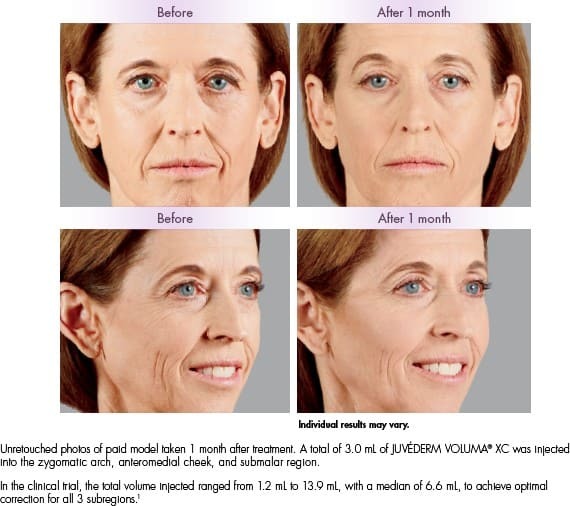 What are the side effects of Juvéderm Voluma®? Side effects are rare and Dr. Abrams and Sheryl Wilson, ARNP-C spend time with patients to answer questions, go over potential side effects and determine if Juvéderm Voluma® is the right treatment to meet the patient’s goals. The most commun side effects are redness, tenderness and swelling at the injection site. Bruising is common and we ask our patients to come back the day following their injection to be treated with the V-Beam Laser in order to reduce the bruising. Actual patient. Results may vary. Unretouched photos taken before treatment and 2 years after treatment. A total of 3.5 mL of JUVÉDERM VOLUMA® XC was injected into the cheek area. The average volume of JUVÉDERM VOLUMA® XC injected during the clinical study was 6.8 mL to achieve optimal correction for the cheek area.